-in collaboration with Amy Abbott, Special Education/Life Skills teacher at Sandwich High School. A dedicated and committed team of teachers, staff and students has worked very hard to bring school-wide recycling to Sandwich High School this year! Teachers Amy Ferreira and Renee Fudala run the Recycling/ Science club and they are also members of the ‘Green Team’; an educational initiative through the MA Department of Environmental Protection which empowers students to help the environment through efforts to “reduce, reuse & recycle.” As a member of the Green Team, we are able to make equipment requests through the MA Department of Environmental Protection! Kari Parcell through Barnstable County has supported us with this process. Jay McGrail, Director of Facilities, coordinated the pick up of the bins in Boston. Ms. Abbott’s student, Tyler Booth, inventoried existing recycling bins at SHS. He determined that the school needed 120 14-gallon recycling bins, 27 7-gallon recycling bins and 6 wheeled carts (for use in the cafeteria to collect empty drink bottles/cans). 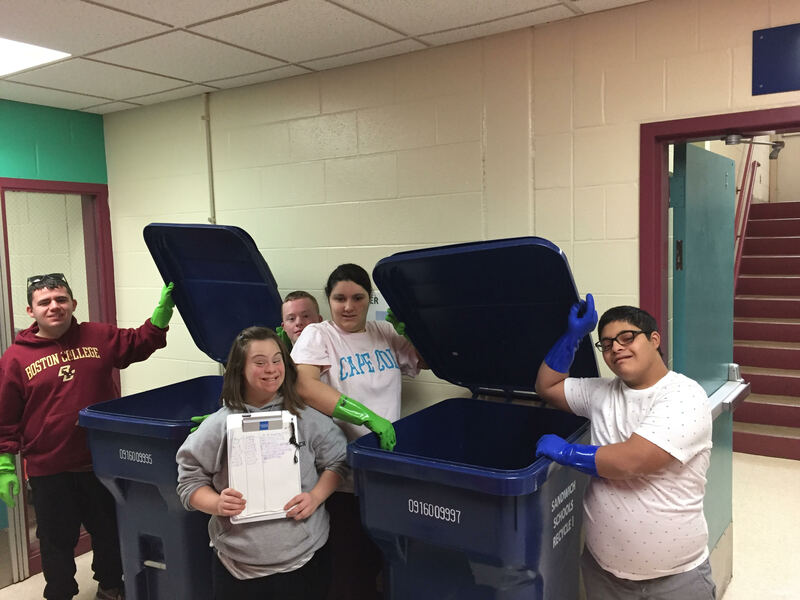 The order was placed through the MA Department of Environmental Protection and once received, Ms. Abbott’s students made sure that every classroom had two bins and that each office had a small recycling bin. The Recycling/ Science Club made a 2 minute public service announcement that was played during advisory prior to the start of our school wide recycling program. They also made signs for the small and large cafeterias. School wide recycling began on October 1st! SHS students, working as teacher assistants, helped to facilitate proper recycling within the cafeterias. They focused on making sure students emptied their water bottles into “liquid waste” bins before recycling. These students assisted for a total of two weeks during all SHS and Stem lunches. Currently Ms. Abbott’s students: Tyler Booth, Payton Desilva, Saad Rashid, Katie Ferrini, Danny Megan and Kiara Taylor collect recycling four days a week. They have divided the school into 4 sections; each section has a specific recycling day. On these days bins are placed in the hallway and the students empty them into the larger toter bins. From there the larger toter bins are brought to the compactor by the school custodians. After every lunch the students empty and rinse the liquid waste containers for the following day’s lunches. Staff members Kathleen Kondratowicz, Marisa Kelley, Rose Donnelly and Jen LeFavor also assist in monitoring and supporting this program on a daily basis. Ms. Abbott recently applied for and received a grant from the Sandwich High School Association (new this year) that she will use to purchase a shed that will be placed in the parent drop off loop in the back of SHS. Parents and community members can drop off bottles and cans from any person who would like to donate. Money made from recycling the bottles and cans will be used to offset the cost of community outings which are an integral part of the Life Skills program at SHS. Thank you to all SHS teachers, staff and students for their support and assistance in this program!